Overview : Send us your scratched or damaged Xbox, Xbox 360, Wii, Playstation 2 (PS2), Playstation 3 (PS3), Gamecube, CD, DVD, HD-DVD, BluRay, PC discs and have them professionally resurfaced and promptly returned to you. Using specialized machine(s) we are able to get great results that remove all scratches and restores the disc to "like new" condition. Notice: We do not guarantee ALL discs will be repairable but we will do our best to repair it to its original playing condition. We are not responsible for discs lost in the mail or in transit. 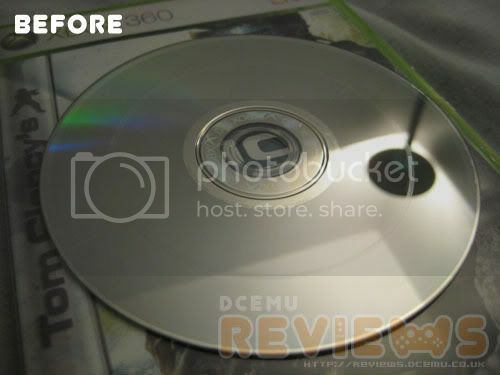 Attention Xbox 360 Users: If you accidentally scratched a game disc in your console like the disc pictured above, we are here to help! This is scratch ring is easily removed with our special machine(s) and techniques. We will restore your disc to like new condition so you can enjoy playing it again. Quality/Usability : So I know we all had a bunch of scratched disc whether it be from poor handling of the disc, letting a sibling, child, pet damage it or from your player. Upon trying to play the disc, it was badly scratched that we had to either try and repair it ourselves with a disc repairer, have a store try and repair it or throw it away. 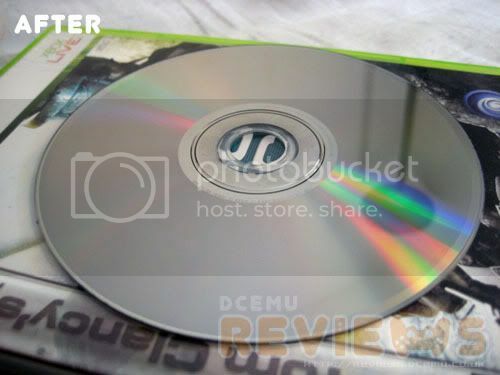 Well, I had Ghost Recon Advanced Warfighter 2 for the Xbox 360. Unfortunately, someone sent this to me from a trade. Upon looking at it, I was greatly disappointed at the condition. I thought it would still work despite the condition and the game would not read or load. I tried taking the disc to many stores such as GameCrazy, EB/GameStop, Blockbuster, FYE and many other retail stores that deals with videogame, movies and music. None would repair my disc. They would only repair lightly scratched discs but as you can see by the image above. I noticed that Extreme-Mods provided a service on repairing discs. Although they state that do not guarantee that all discs are repairable, I was willing to give it a shot. I have nothing else to lose. No other stores would take it and the disc is already useless. I have nothing to lose. Cost of repair is $5.99 per disc. Shipping starts at $3.38 for First Class. Depending on how many discs you send and how heavy the package is, price of shipping will vary. I sent the disc with a blank DVD case and it costs around $2.00 via First Class, give or take a couple of cents (depending on location). If you add any extra services such as tracking or insurance and what shipping method, it will cost more. So in total, it will cost almost $12 just to ship, have it done and shipped back to you. Having shipped the package on a Monday via First Class, it arrived within a couple of days. Extreme-Mods had the item shipped back 2-3 days after receiving it. I received the package a couple days later. So in total, from shipping to receiving, it took almost 2 weeks. Again, depending on shipping method you choose, it could be sooner. As you can see from the picture, the ring scratch is no longer visible. But upon looking at it very very and I mean, very closely, I can still see a little bit of a ring that was left. This is only visible held in a certain way with the right lighting. Other than that, its impossible to see. Also, the machine used to repair the disc left some very very small hairline buff marks. Again, this is impossible to see unless held in a certain position and lighting. Conclusion : Overall, the Extreme-Mods Disc Repair Service exceeded my expectations. I was expecting maybe a Disc Doctor type of repair where it would leave huge buff marks or Extreme-Mods emailing me and informing me that it was unrepairable. The disc is useless already...so I have nothing to lose. Extreme-Mods repaired a disc that no other store would perform. Even if the stores said that they can try to repair but couldnt guarantee that it can, I would of given it a shot. But they turned me down. After being denied of repair from stores, I was so close to snapping the disc in half and tossing the disc in the garbage until I found the repair service. Extreme-Mods says they usually ship the disc back in 24-48 hours but it took about 48-72 hours due to them being a little swamped. Now, I am able to trade this game rather than have a coaster on my hand. So is it like new condition? Yes, definitely. However, the cost of repair including shipping costs is a bit too high and may put a dent in the wallet. $6 to resurface a disc? $3 would of been more reasonable. If sending disc(s) to be repaired, use a bubble padded envelope and place discs in a blank DVD case or something sturdy to prevent it from being snapped during transit. Guests online: 454. Total online: 455.